UFS Explorer Standard Recovery software was designed with the aim to make even complex data recovery a simple procedure to be easily carried-out by both home users and professionals. The software embraces powerful mechanisms that allow to recover accidentally deleted data and data lost due to logical file system damages after formatting hard disk, hardware malfunctions or software failures, virus attacks, power outages etc. 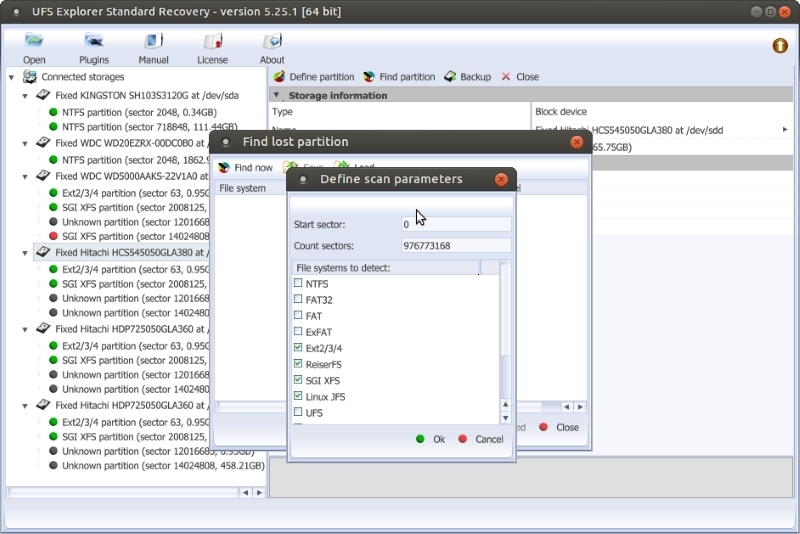 UFS Explorer Standard Recovery all in one supports a wide range of operating and file systems – Windows (FAT and NTFS); Apple Mac OS (HFS+); Linux (Ext2, Ext3, Ext4 , Reiser, XFS, JFS (JFS2) and FreeBSD (UFS/UFS2). This program fits for recovery from different devices and supports recovery from disk images and virtual machines – you can recover lost files from your PC, USB flash drive, memory card of your photo/video camera, external hard drive as well as a virtual machine or disk image file with one and the same tool. For enhanced capabilities the software was supplemented with plug-ins for reconstruction and further recovery from complex RAID-systems as well. User-friendly interface of UFS Explorer Standard Recovery will offer clear step-by-step guidance through sophisticated data recovery tools of the program that makes all complex operations to be conducted in just several mouse-clicks. In its work UFS Explorer Standard Recovery applies advanced techniques to scan the device for lost data and recover lost and deleted files. The software works in a safe read-only mode without making any modifications on the storage. For increased convenience the software has several variants suitable for your operating system type. UFS Explorer Standard Recovery will make data recovery easy, safe and cost-efficient operation without any harm to your data and any stress to you. Planetsofts.com didn't scan UFS Explorer Standard Recovery (Linux) for viruses adware, spyware, or other badware. For safety reasons, we recommend that you always keep an updated antivirus installed on your pc when downloading and installing software from the web.